Glendalough is famed for its beautiful scenery and historic monuments, but has also been a centre for pilgrims and visitors from the time of St. Kevin, (from whom the bus service took its name). This is where St. Kevin,descendent of one of the ruling families in Leinster, founded his monastry in the sixth century. As a boy he studied while in the care of three holy men. During this time he went to Glendalough and lived, we are told, "in the hollow of a tree". He left the valley, only to return later with his small group of monks to found the monastry where, as the earliest versions of his life tell us, "the two clear rivers form a confluence". His fame as a holy man spread and he attracted numerous followers. Glendalough flourished and many references in the Irish annals describe the activities of successive Abbots and visitors to the area. The monastry was the subject of frequent plundering, burning and rebuilding in its lifetime.The present remains in Glendalough tell only a small part of the monastic storey. The valley has both a Hotel and a Hostle in the valley. Glendalough Valley is a National Park and camping is not permitted. 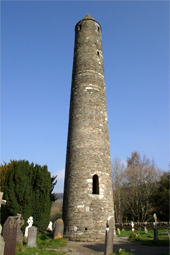 Glendalough has many attractions, from the Round Tower to the Upper Lake. Take a look at these links to find information and pictures.